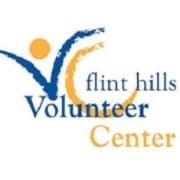 The Flint Hills Volunteer Center serves as a clearinghouse for all things related to volunteerism and provides a strong network for organizations in the area. We work closely with area non-profit organizations and provide a wide range of resources for volunteers of all ages. A great variety of volunteer positions are available within the Flint Hills region! Different positions can include working with youth as a mentor, assisting with tax preparation or in thrift stores, help with food distribution, and work with a variety of programs assisting seniors within our community. The Flint Hills Volunteer Center also has several Signature Program. Senior Corps RSVP: the heart of our community; matching prospective volunteers, aged 55 and older, with local nonprofits to help them help others. Schools of Hope: volunteers work one-on-one with children (grades K-3) who are struggling with reading. Youth Volunteer Corps: allows youth, ages 11 to 18, the opportunity to serve their community with volunteer projects that are challenging, rewarding and educational. Veterans and Families Support Program: provides support to the Fort Riley USO with the Cookie Brigade and No Dough Dinners. Partnerships also available with the SAVE Farm, serving transitioning service members and veterans. Opioid Epidemic: volunteers will help to distribute medical disposal kits to community members while educating on the rising opioid problems in our country. Suicide Prevention: volunteers will become trained to provide community suicide prevention education to identify signs of suicide and encourage those at-risk to get help. Elder Justice: volunteers will provide the Money Smart for Older Adults education program to elderly community members and their families. Contact the Flint Hills Volunteer Center for assistance in finding an opportunity that works for you!